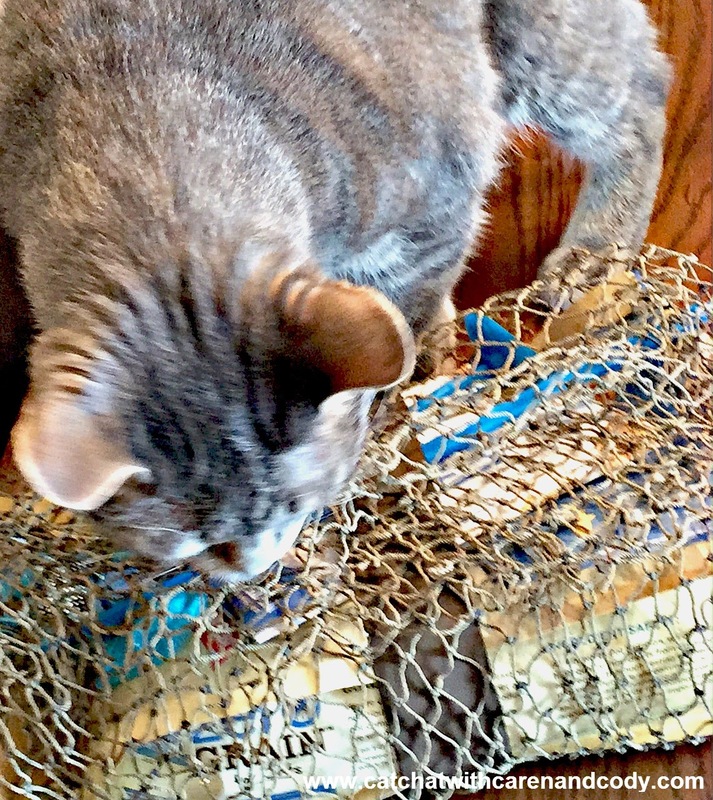 Cat Chat With Caren And Cody: "Catch of the Day!" NEW from Rachael Ray! 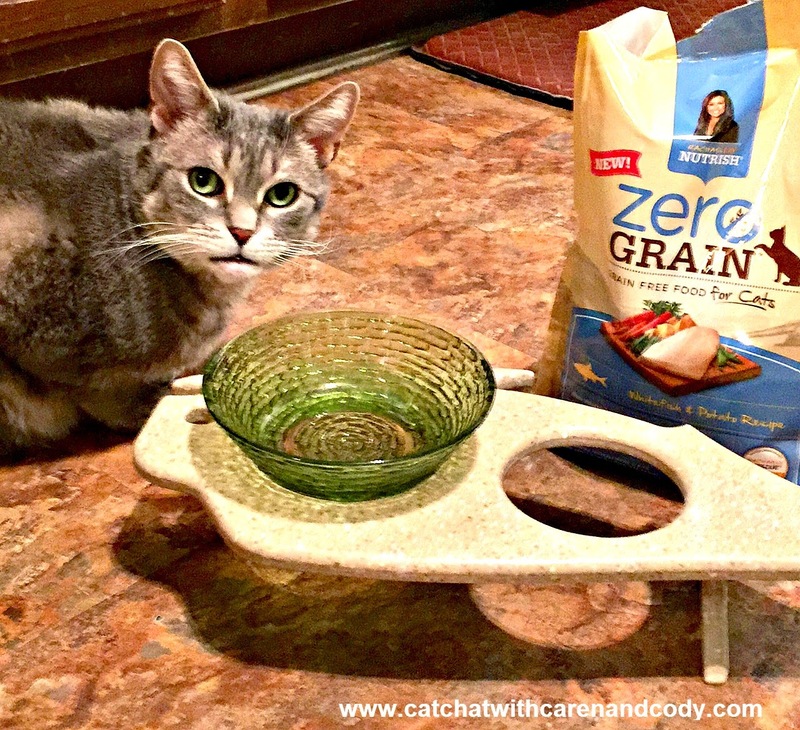 It's #NutrishZeroGrain Whitefish and Potato Recipe for Cats!! "Catch of the Day!" NEW from Rachael Ray! 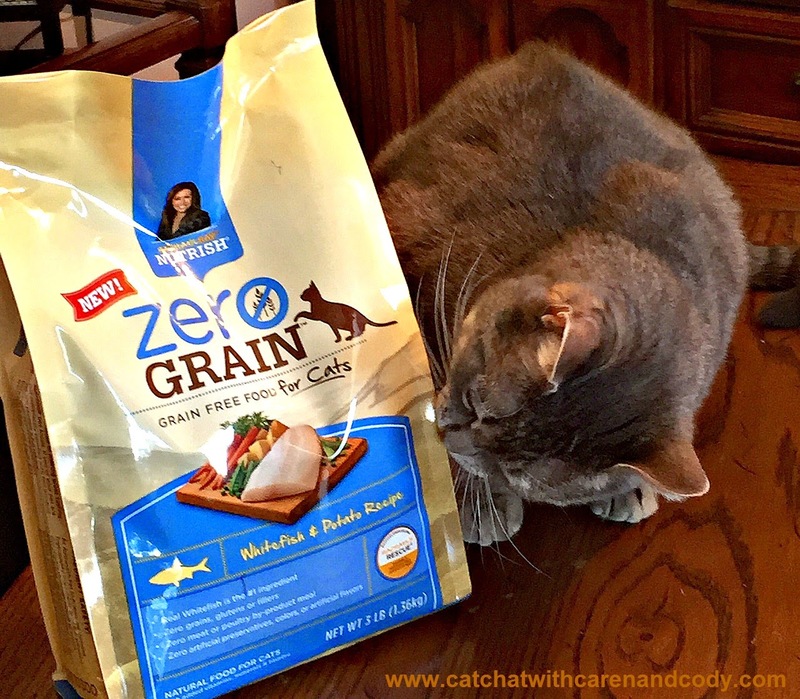 It's #NutrishZeroGrain Whitefish and Potato Recipe for Cats!! 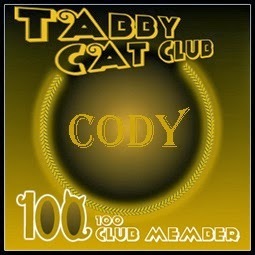 Hi My Furiends it's Cody!! It has been longer than nine lives since I have meowed to you about Rachael Ray Nutrish for Cats, why? Well, while I have been busy eating Nutrish around my house, I didn't really have anything NEW to tell you, that is....until NOW!! Gather round kitties, wait til you see! A few weeks ago I was just lolling around enjoying a sunbeam, when I heard noise outside of our door. My ears perked up, my nose twitched, I sensed it was something super exciting and boy oh boy was I ever right! Mom pushed Dakota out of the way, and brought in the most wonderful box from my friends at Nutrish! I could barely wait to get my paws on the goodies inside! This was getting super exciting!! 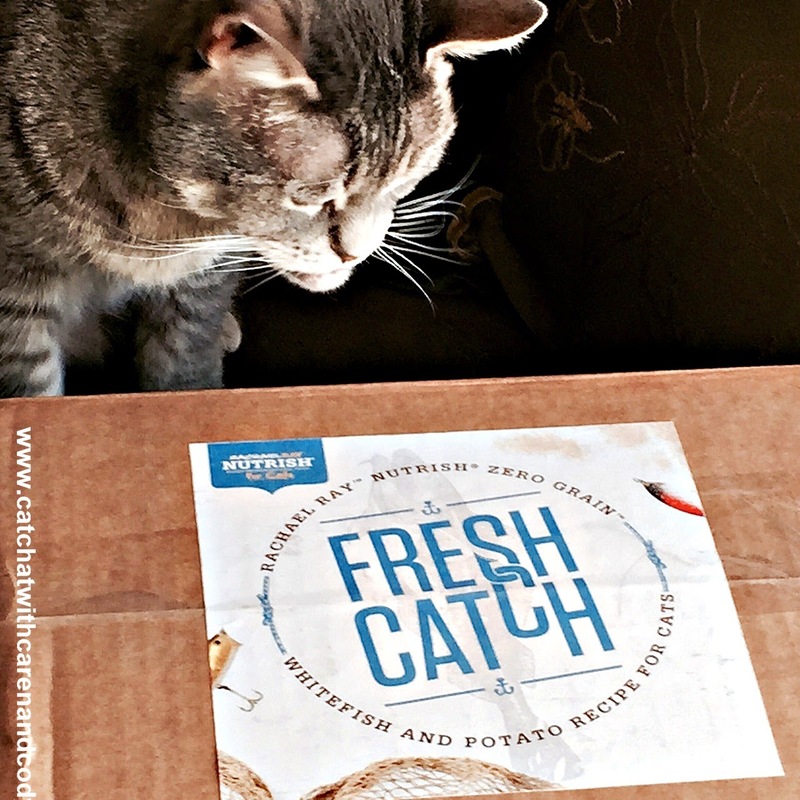 My nose KNEW that inside of this bag was the NEW Rachael Ray Nutrish Zero Grain Whitefish & Potato Recipe dry cat food, and I sooo wanted to get my paws on it!! Well, in my house, this kitty sometimes has to work for his supper, and since Nutrish was nice enough to also include a super cute fish cat toy, I thought I would humor my Mom and pose for just ONE obligatory shot. Mama didn't raise no fool, and I knew the sooner I posed, the sooner I could get my paws on the new cat food! Because Rachael Ray Nutrish may offer different ingredients than your cat is used to, it may take up to ten days for your cat's system to become acclimated to Nutrish. Slowly mix with his or her other food over a five- to ten-day period until your cat is solely eating Nutrish. 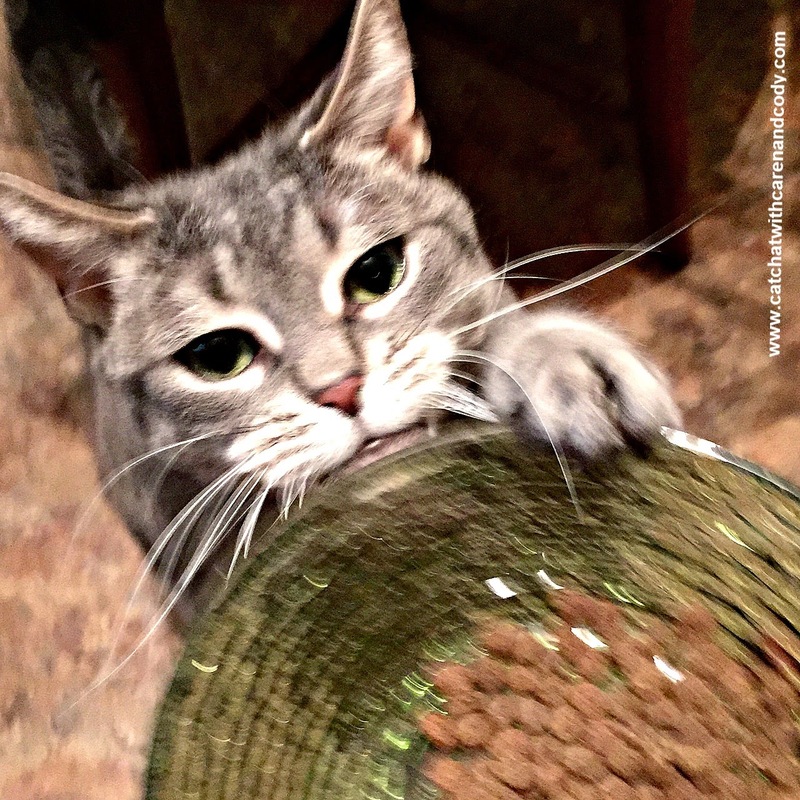 Mom makes it a point to try and keep me at my happiest and healthiest and she knows that playtime is super impawtant, as well as feeding me food that is not only "delish", but that is GOOD for me! Enough of the "good-for-me" stuff! Bring it on Mom!! 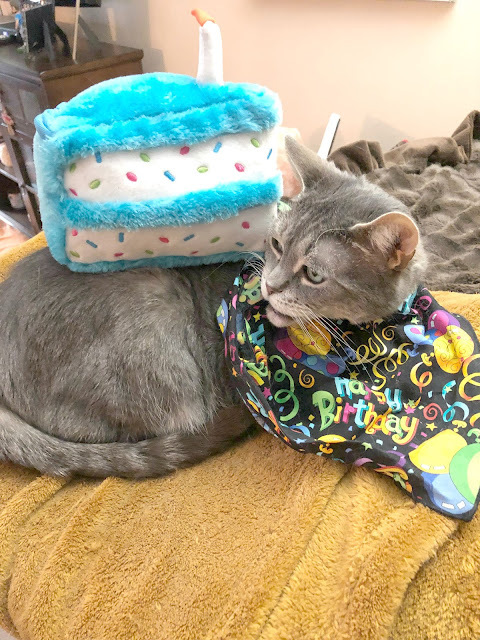 I am not normally allowed to be eating on the table but Mom said I could this ONE time, just so you could see me eating and for you to notice the super cute fish tray that I have been eating my food on for months!!! Once I finished, I couldn't believe that Mom wasn't giving me more! This was one time I could have used opposable thumbs for sure! Step on it Mom! In 2007, with help from pet nutrition experts, Rachael Ray created Nutrish ultra-premium food and treats for dogs. My woofie brother Dakota, has been eating Nutrish since 2008 and that is the ONLY dog food that he eats! 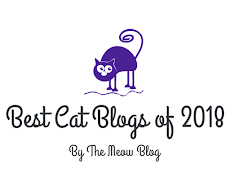 In 2014, Nutrish was super excited to grow the brand into the world of cat food and I was super excited about it too! Whether intended for dogs or cats, Nutrish recipes are made with simple natural ingredients and do not contain meat or poultry by-product meal or fillers. Real meat is the #1 ingredient in their cat food and all recipes were inspired by Rachael’s kitchen. Rachael’s personal proceeds go to Rachael’s Rescue, created to help shelter pets. As of today, over $9 million has gone toward food, medical supplies and treatments for animals in need! Nutrish prides themselves on bringing pet specialty quality food to the masses. They are the first premium brand that is only available in your local grocery store (I get mine at one of our local Krogers), as well as mass retailers like Target, Walmart and Amazon. 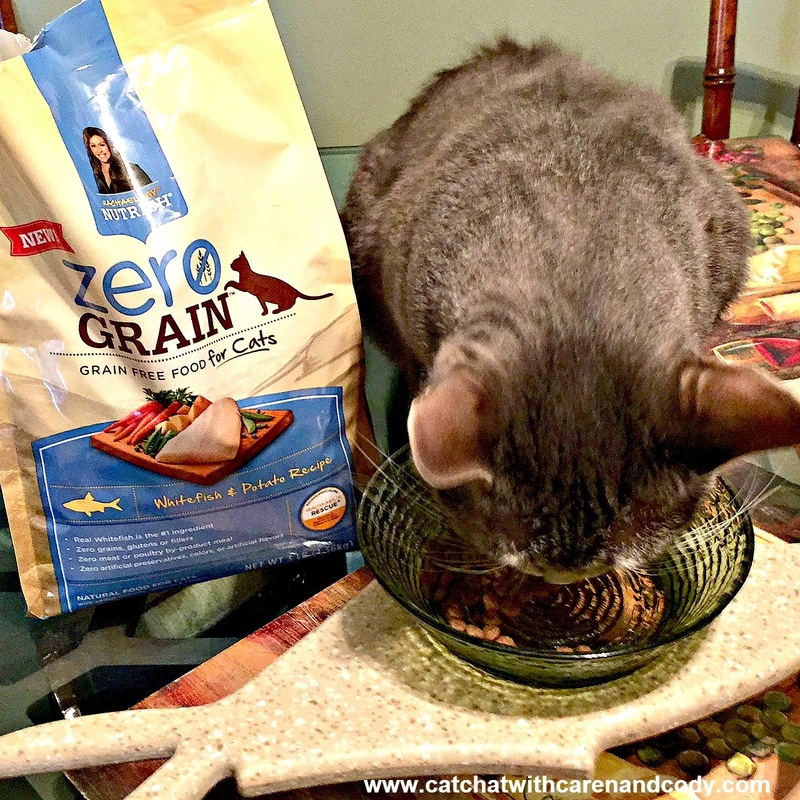 Get YOUR $3 off coupon to try Zero Grain Whitefish and Potato Recipe for Cats! Tell them Cody sent ya! Cool stuff Cody. Have a fabulous Friday. This really does sound DELISH - maybe Mom will get some for me to try - I'm super picky about food, especially my kibble, but who knows - this might do the trick and it's a lot better for me than stuff with grain I'm sure! Thanks for the info Cody! We saw this food at the pet store. The mom didn't buy it...but we think she better because we wanna try it! Thanks, Cody! It sure looks like a hit with you. I love that you got a toy and it came in a cute fish net :) Thanks for the coupon link. 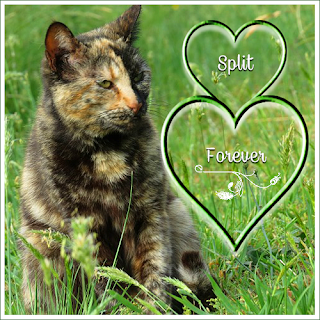 Hi my furiend it sure is!!! Isn't the fish net just too cute? You are most welcome for the link! When you try it, please be sure to let us know what your kitties think of it! That does look like great food. We do eat other kinds of Nutrish sometimes. So we will have to try this new kind. Great review Cody. Have a great day. Looks like it's a big hit with you Cody. Good for you. You gave that box a what for too. Our Little Bit (a 65 pound dog) is allergic to some many things and wheat is one of them. It's good that there is now a cat food that is grain free. And not chicken either. Little Bit is allergic to chicken too. Oh yes it IS a big hit!!! Yep! I was trying to open the fishnet in the box! Mom says she was lucky, she didn't notice til she saw the video that my ample tush was hanging over and the box was teetering precariously on the table MOL. Mom says I am lucky (or SHE is lucky) that it didn't fall over!! Yes, grain free cat food is a pawesome idea! Do you know Nutrish also has Grain Free Dog food too! Dakota has been eating Nutrish since 2008. He sometimes eats the grain free formula as well. You should check it out for Little Bit, bet he would like it! You make that food look good, Cody! You've made us hungry now! Enjoy your delicious new noms!!! Dang Cody, that sounds and looks like quite the yummy catch! I couldn’t see the videos but the food looks really good! TW was in PetSmart yesterday and even looked at the Nutrish and didn’t notice it. I get a mixture of kibble to nosh on at night if I choose and one is the RR Salmon and Brown Rice. I just checked their website and yep...PetSmart is a recent addition...that being said, the PetSmart within walking distance to MY house does NOT carry it (figures!!!) Some of the pet stores are new additions because PetSmart never used to carry it at all. I also noticed it is sold on the Pet360 website............I am going to check that out to see if they have more flavors on the wet than my Kroger does. What a great surprise Cody. WE are so glad you are enjoying your box full of goodness. I had to hunt for a grain free food for our Lucy- finally found one she actually likes! It is for sure! Cody loves it!!! The package was so adorably wrapped, super clever! Have a great weekend! Could I have some please Cody heheh! Sure you can!! Come on over!!! We'll have a Zero Grain pawty!! MOL! You know, HUMANS can eat it too! There are no ingredients in Nutrish that humans can't eat! 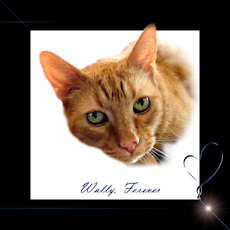 OMC I Loved when you wrote "have a zerograintastic weekend" MOL!!!! Oh, by the way, we wanted to let you and your Mom know that we received our book! And the fun little talking birdies you included in the package, too. 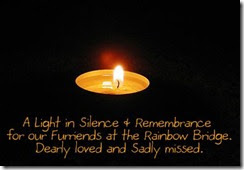 Thank you, dear friends. That does look and sound very tasty. Woah, Cody! You were really going for it. Glad you enjoyed it! - Crepes. If cats had thumbs - food would be in that bowl! Such an endearing post . ♥ . Cody, if yous says its good, wes gots to gets us some! That food sounds like it has pretty good ingredients but mom doesn't let us eat dry food. Have a great weekend. This looks so good - wish we could buy in Australia. You sure gobbled that up!! YUMMY! Haha, we guess the service is kind of slow around there so you had to help yourself, Cody! 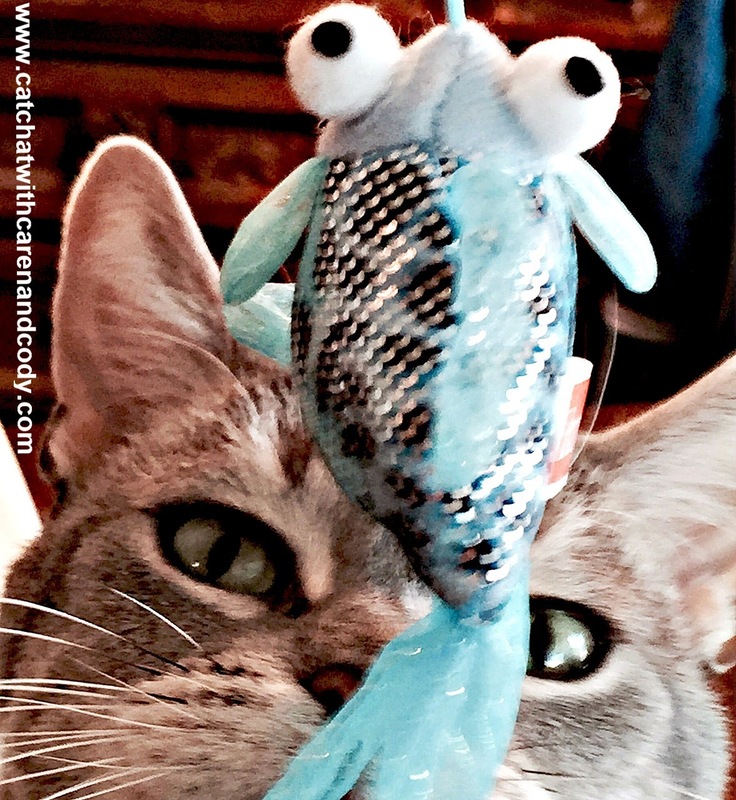 This food sounds good and what a nice package you got in the fish net and with a fun fish toy! It seems that you really like your new food Cody. But you have to be careful. Most of the time dry food without grain is more rich than dry food with grain. That's why I use it as small snacks. Juat looking at you nomming is a treat for me. Wanna play date after supper? I have a NEW nip hammer. I horked on the old one. nip NANNER! silly spell correct! You are so cute, Cody! What a great package to get, how exciting! Bet it was super yummy, loved the photos! Wow you must really have enjoyed that food. I do! I eat it every day!